Editor’s Note: This article was authored by Michael Gleghorn and Rodger Young.1 The graphic was created by Hannah Gleghorn. Over the past year and a half my wife has been working on what might be called a “visual Bible.” By training and profession my wife is a graphic designer. She tends to understand things best when she can visualize them in some way. Hence, when she began team-teaching a women’s Bible study that covers the entire Bible in just two years, she felt the need to create visuals of what she was studying in order to help her grasp some of the key points in a single glance. Thus, week-by-week, as she readied herself for class, she also prepared a wide array of graphically-designed visuals of the written contents of Scripture. Everything was going fairly well until she came to the Old Testament books of Kings and Chronicles. 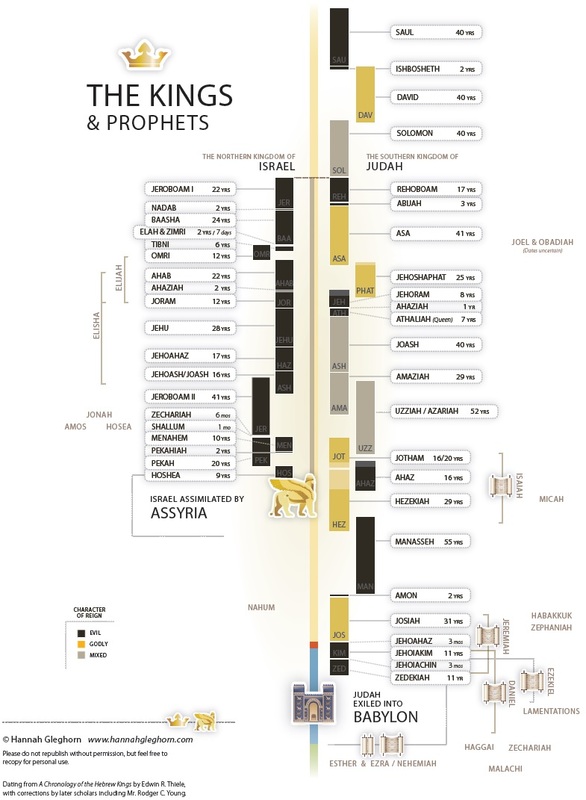 Since these books give us a great deal of information about the kings of Israel and Judah, including the order in which they reigned, the lengths of their reigns, and so on, she decided to create some charts that would present all of this information visually. She had no idea that she was about to enter one of the most baffling and perplexing issues of biblical chronology! To put it bluntly, the chronology of Kings and Chronicles initially appears to be a hopelessly muddled, and even downright contradictory, mess! Examining this material as an intelligent layperson, my wife could make no sense of it at all. It also meant that she could not represent the material in a visually coherent way. Feeling increasingly frustrated, she asked if I knew of any books that dealt with these problems. Although this is an area I know little about, I remembered a book which (I had heard) handled these issues quite well. That book, The Mysterious Numbers of the Hebrew Kings, by Edwin Thiele, offered her some much-needed help in making sense of the apparently confused and contradictory information in the books of Kings and Chronicles.2 Although this book did not solve all the difficulties she was facing, it did bring a great deal of order to the apparent chaos of this section of Scripture. In the remainder of this article we’ll first consider the problems posed by “the mysterious numbers of the Hebrew kings.” Afterward, we’ll briefly look at how all these problems have been solved by contemporary scholars, so that what was previously thought of as a hopeless muddle is instead a testimony to the accuracy of the historical parts of the Old Testament. Indeed, the difficulties with Old Testament chronology at this point were so great that many scholars simply assumed that the biblical records were unreliable. But why? What was it about these numbers that made so many scholars think they were in error? Since we’ll later be discussing the two different kingdoms of Israel and Judah, let’s begin by considering two imaginary kingdoms, both of which celebrate a new king coming to the throne on March 1 of the same year. In other words, both kings begin their reigns on exactly the same day. Now one would probably think that, as the ensuing years go by, court historians from both kingdoms would agree about how many years each of these kings have ruled their kingdoms. But in fact, this is not necessarily true. Hence, although both kings began to rule on precisely the same day, the years of their reigns are counted differently. The first king begins his second year of rule on January 1, 2001, while the second king only begins his first official year at that time. This is just one of many issues that complicate the dating of the kings of Israel and Judah as they’re recorded for us in the Bible. Once these issues are taken into account, however, a completely harmonious chronology of these kings becomes possible. Let’s now consider a biblical example. We’ve been looking at some of the chronological puzzles in the biblical books of Kings and Chronicles. With apologies for the unavoidable names and numbers which follow, let’s consider an example. At this point we have a decision to make. We could decide that all of this shows that the Bible is not to be trusted in its numerical and historical statements. This is the path taken by critics who say that these parts of the Bible were invented many years later than the happenings they describe. Or, we could give the authors of these texts the benefit of the doubt and consider that these texts show a consistent pattern. The pattern is that the northern kingdom was counting the years of reign for their kings in the fashion mentioned previously, where a king could count the year in which he came to the throne as his first year of reign, so that even if he only reigned exactly one year, he would be given credit for the calendar year in which he became king and also for the calendar year in which he died. This is a method that was used by other Near Eastern kingdoms. With this second approach, success has been achieved in reconstructing the history and exact chronology of the Hebrew kingdom period. We will now consider other factors necessary in understanding these so-called “mysterious numbers” of the Bible. We’ve seen a pattern in the chronological numbers that the Bible gives for the first years of the divided kingdom. We saw that, in these early years at least, the northern kingdom was counting the year that a king died twice; once for him, and once for his successor, so that one year must be subtracted from a reign length when counting elapsed time. By carefully considering the facts as given in the Bible itself, we can determine when the two kingdoms were using this method of counting, and when they were using the other method in which a king’s first year was not counted until he reigned a full calendar year. Other coregencies are not quite so obvious, but the books of Kings and Chronicles always give us enough information so that we can determine when the years of a king’s reign are being measured from the start of a sole reign or from the start of a coregency. For the northern kingdom, Israel, there are also two cases of a rival reign, similar to the rival reigns of Egyptian pharaohs that Egyptologists take into account when reconstructing the chronology of Egypt. As an example, Omri, the father of Ahab, is said to have reigned for twelve years,13 but this only makes sense if the twelve years includes the five years in which he had a rival, Tibni, reigning in a different capital.14 Coregencies and rival reigns are the second major key to understanding the chronology of the Hebrew kingdom period. In previous sections we considered two factors to take into account when interpreting the rich chronological data of Kings and Chronicles. The first is that there were two ways of counting the first year of a king’s reign; whether it was to be counted twice, once for him and once for the king who died in that year, or just once so that the king’s first year was his first full year of reign. The second factor was that occasionally a king’s reign was measured from the start of a coregency or rival reign rather than from the start of his sole reign. Both principles were applied, although not consistently, by some earlier interpreters.15 A third principle, discovered by Edwin Thiele, however, was not used by these interpreters. This principle showed that the southern kingdom, Judah, started counting the years of a king’s reign in the fall month of Tishri, while the northern kingdom, Israel, started six months earlier in the spring month of Nisan. Many earlier interpreters thought that both kingdoms started their year in Nisan, but this produced several small errors that they were unable to reconcile. Unknown to Thiele, all three of these principles had been previously found back in the 1920s by a Belgian scholar.16 But Thiele worked out things in a more satisfactory way, and so his Mysterious Numbers of the Hebrew Kings should be the starting place for understanding the chronology of the kingdom period. Regrettably, however, Thiele did not recognize that a problem he had with the texts of 2 Kings chapter 18 is explained by a coregency between Ahaz and Hezekiah.17 His chronology also needed slight adjustments for the reign of Solomon and for the end of the kingdom period.18 In our own studies we have followed the corrections to Thiele published in several articles by Rodger Young.19 Young responds to the specious claim that the harmony now evident in the chronology of the kingdom period might be the result of a clever manipulation of the data by those who follow the principles outlined by Thiele. Young answers, “The complexities of 124 exact synchronisms, reign lengths, and dates in 1 and 2 Kings, 1 and 2 Chronicles, Jeremiah and Ezekiel negate that possibility unless the data were historically authentic.”20 With the proper understanding of the methods used by the ancient authors, the chronological data of Kings and Chronicles offer a remarkable testimony to the strict accuracy of the Bible’s 400-year history of the two Hebrew kingdoms. 1 This article was written by Michael Gleghorn and Rodger Young. Gleghorn’s initial inspiration for writing this program resulted from conversations with his wife, who struggled with the “mysterious numbers” in Kings and Chronicles for quite some time before encountering the help provided in the book by Edwin Thiele and, more particularly, the articles of Rodger Young. Mr. Young received a B.A. degree from Reed College, B.A. and M.A. degrees in mathematics from Oxford University, and has done graduate work in theology and biblical languages at the Nazarene Theological Seminary in Kansas City. He retired from IBM in 2003 and began writing about OT chronology. He and his wife attend the West Overland Bible Church in the St. Louis area. 2 Edwin R. Thiele, The Mysterious Numbers of the Hebrew Kings, New rev. ed. (Grand Rapids: Kregel, 1994). 4 Thiele describes this as “nonaccession-year dating” or “antedating.” See Thiele, Mysterious Numbers, 231. 5 Thiele terms this “accession-year dating” or “postdating.” See Ibid. 7 1 Kings 15:25, 28. 8 1 Kings 15:27, 33. 10 1 Kings 16:8, 15. 11 1 Kings 1; 1 Chronicles 23:1. 15 For example, James Ussher. 16 Valerius Coucke, “Chronologie des rois de Juda et d’Israël,” Revue Bénedictine 37 (1925): 325–64; idem, “Chronologie biblique” in Supplément au Dictionnaire de la Bible, ed. Louis Pirot, vol. 1 (Paris: Librairie Letouzey et Ané, 1928), cols. 1245–79. 17 According to Rodger Young, “Several authors put forth this rather obvious solution, among whom were Kenneth Kitchen and T. C. Mitchell, Siegfried Horn, Harold Stigers, R. K. Harrison, Leslie McFall, and Eugene Merrill.” Of course, we could also add Rodger Young’s name to this list as well. For details see Young, “When Was Samaria Captured? The Need for Precision in Biblical Chronologies,” Journal of the Evangelical Theological Society 47, no. 4 (2004): 580. 18 For a one-year correction to Thiele’s dates for Solomon through Athaliah, see Rodger C. Young, “When Did Solomon Die?” Journal of the Evangelical Theological Society 46, no. 4 (2003): 589-603. By showing that the dates of Solomon through Athaliah must be moved one year earlier than in Thiele’s chronology, Young has resolved a problem that Thiele addressed by revisions in the third and final edition of Mysterious Numbers, but Thiele’s revisions merely moved his problem with the reign of Jehoshaphat to the reign of Athaliah. Among those accepting Young’s solution of the problem are Leslie McFall, “The Chronology of Saul and David,” Journal of the Evangelical Theological Society 53, no. 4 (2010): 533 (chart), and Andrew E. Steinmann, From Abraham to Paul: A Biblical Chronology (St. Louis: Concordia, 2011), 133-34, 138. Young has also written extensively on why 587 BC, not Thiele’s 586 BC, is the correct date for the fall of Jerusalem to the Babylonians. See “When Did Jerusalem Fall?” Journal of the Evangelical Theological Society 47, no. 1 (2004): 21-38; “Ezekiel 40:1 as a Corrective for Seven Wrong Ideas in Biblical Interpretation,” Andrews University Seminary Studies 44, no. 2 (2006):267-70. 20 Rodger C. Young, “Inductive and Deductive Methods as Applied to OT Chronology,” The Master’s Seminary Journal 18, no. 2 (2007): 116.